‘Hugo’ is director Martin Scorsese’s first foray in a long while that is in complete unfamiliar territory. For starters, this is his first film absent of Leonardo DiCaprio in 10 years. Secondly this is the first Scorsese picture intended for all ages. Notice I didn’t say “intended for kids.” I don’t think Scorsese set out to make a kids movie, I think he definitely set out to make a movie that could be enjoyed by anyone of any age (kids included!). Adapted from the novel “The Invention of Hugo Cabret” by Brian Selznick, the film tells the story of a boy who lives alone in a Paris train station, and a curious toy shop owner. Hugo (Asa Butterfield), orphaned at a young age lives in secret, running around in the background keeping the station’s clocks in order – a job he took over from his drunken Uncle who adopted him after the passing of his father. The one possession he still has from his father is a mechanical man, an automaton. A project he was working on with his father. 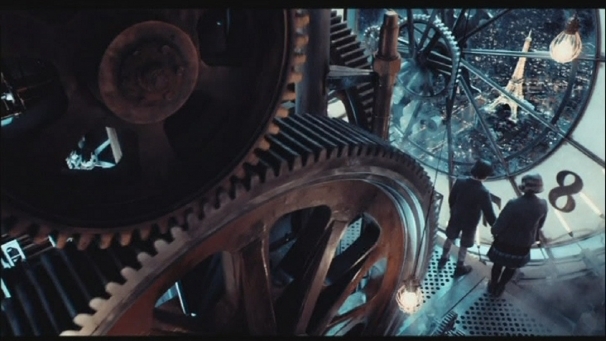 Hugo believes that the automaton holds a secret final message from his father, and is working tirelessly to fix it. Hugo acquires parts by stealing them from the toy shop, owned by Papa Georges (Ben Kinglsey). 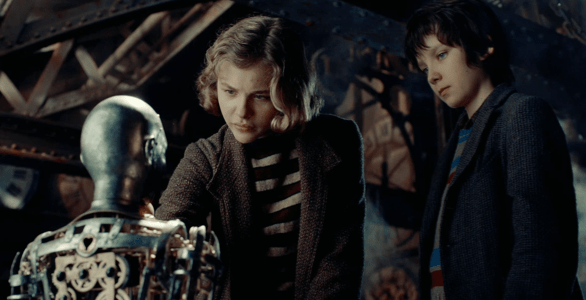 When Papa Georges takes Hugo’s notebook as payment for what he’s stolen, Isabelle (Chloë Grace Moretz), Papa Georges goddaughter, begins to help Hugo – beginning their wonderful adventure. Scorsese films are known for their amazing cinematography and camera work. Whether its the long tracking shots in ‘Goodfellas,’ or the swooping shots of planes in ‘The Aviator,’ Scorsese and his DP Robert Richardson love moving the camera. In the opening of this film, they use every trick in the book. It’s mind-blowing. The seamless movement through practical, and CG sets, all while closely following Hugo looked amazing – this scene alone is worth the price of admission. Asa Butterfield proves himself to be a talented, wonderful actor. The emotions he displays, especially in the pivotal moments of them film are quite believable. Moretz, who at a young age already has a great catalog of work under her now has another amazing film under her belt. It was also great to see Sacha Baron Cohen in something other than his own characters. I’m not the greatest proponent of 3D films. I don’t like it for a lot of reasons. But I have said, if there is any director who could do anything amazing with the medium, it’d be Scorsese. I was right. This film is hands down, the greatest 3D film I’ve seen. The way the depth and dimension is used exceeds what we saw in Avatar. Subtle things like dust in the train station, or light from a film projector surrounding a characters head – everything looked amazing. There is no reason why every single person of any age should not see this movie. Amazing cast, amazing story, amazing cinematography, this film is a great reminder that, yes, there still can be great films that can be enjoyed all.